At the 2015 Reebok CrossFit Games, Sydney Sullivan dominated the competition, taking first place in five out of six events in the Teenage Girls 14-15 Division, and was crowned the Fittest Teen on Earth. She was also struggling with a serious chronic disease: Type 2 juvenile autoimmune hepatitis. Diagnosed at age 12, Sullivan managed her condition through a combination of a healthy diet, CrossFit and medical care. 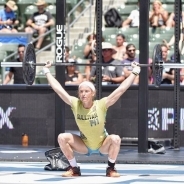 However, as the 2016 Reebok CrossFit Games drew closer, Sullivan began losing weight and feeling fatigued as the symptoms of her illness worsened. That year, she would finish a highly respectable sixth place, but Sullivan could feel her health declining. Caught in a catch-22 situation, her health markers were still far “too healthy” to be considered for a traditional deceased-donor liver transplant. At the suggestion of her doctor, her family began the process of finding a donor and a facility for a live-donor transplant. Ultimately, her brother, Tommy, was able to give 60 percent of his liver to Sullivan, and together the two embarked on a slow path to recovery. Today, they work together at his affiliate, Koda CrossFit Tulsa where Sullivan is a coach. I caught up with Sullivan at the 2018 Reebok CrossFit Games to hear how she managed a chronic illness while being among the world’s fittest and the lessons she learned through her experience that she hopes to share with others.